Especially for fashion, urban manufacturing offers a great opportunity to create an alternative to the criticized production in low-wage countries. This is possible today through new technologies that are currently changing not only the fashion itself, but also the way it is designed and produced. Re-FREAM will explore, how can digitally-enabled small-scale production/manufacturing systems and networks combined with artistic exploration and creativity in design and process – revive the social, ecological and economic urban space and lead to unexpected products and services in an urban environment. Are you taking the challenge of re-inventing fashion? 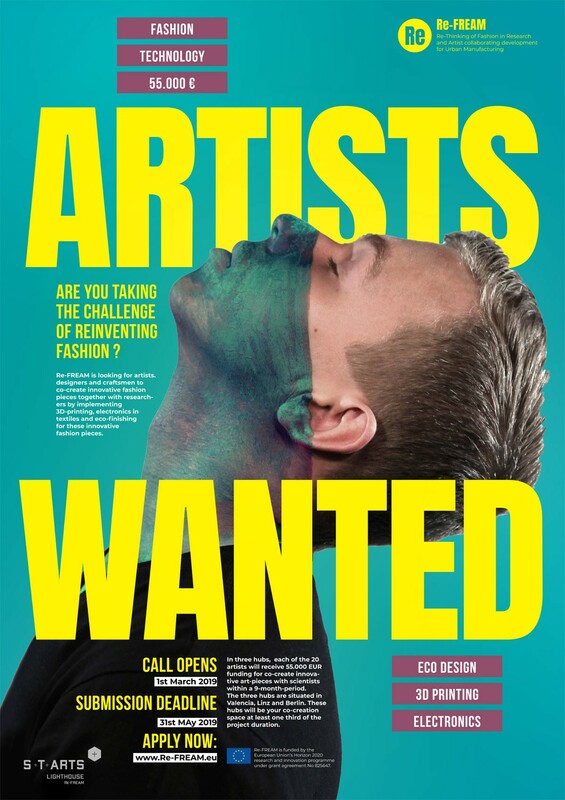 Re-FREAM is looking for artists and designers to co-create innovate fashion concepts together with researchers with novel production technology by implementing 3D-printing, electronics, in texile and eco-finishing for these innovative fashion pieces. Artists and Designers from all over the world are welcome to submit their proposals! Call will be open from 1st March to 30th May, 2019 (3 pm). Re-FREAM offers three Co-Creation spaces where you can co-create your concept with scientists within a 9-month-period. These hubs will be your co-creation space at least one third of the project duration. · Re-think Fashion from linear to sustainable circular systems located in Valencia, Spain. · Re-think Fashion from 2D to 3D located in Linz, Austria. · Re-think Fashion from analog to connected located in Berlin, Germany. – have access to a pool of cutting-edge technologies in order to develop an outstanding and innovative concept. – connections & networks to relevant players within all project locations. – be funded with up to max. 55.000 EUR. 20 artists will be funded in 2 Calls to co-create innovative art-concepts with scientists. Re-FREAM project is financed by the European Commission (H2020-ICT-2018-2020) which aims to support art-driven innovation in European R&I projects by inclusion of artists in research consortia via linked third-parties with strong support from art-related partners, European Institute of Design, creative hubs and facilitators combined with remarkable technology. Research will be initiated by an European wide open call for artists answering specific challenges in “Additive Manufacturing” “Electronic and Textiles” and “Sustainable Finishing of Fashion” and will be explored in 3 identical research hubs providing access to high end technology, material, know how and facilities and interconnected through common research activities. The project is coordinated by CREARE and the consortium is composed by art-related partners, creative hubs and facilitators combined with remarkable technological centers as AITEX.